bl.uk > Online Gallery Home	> Online exhibitions	> Asia, Pacific and Africa Collections	> Cashmere Gate, Delhi, Punjab. This print was taken by Samuel Bourne in the 1860s to form part of an album entitled 'Photographs of India and Overland Route'. 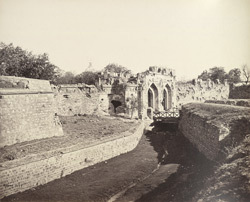 The Kashmir Gate, at the northern end of the the Mughal city of Shahjahanabad at Delhi, was the scene of desperate fighting when the British retook the walled city during the Indian Mutiny, 1857. A troupe of soldiers from Meerut pleaded with the old Mughal ruler, Bahadur Shah Zafar, to lead them in the war for Independence and proclaimed him Emperor of India. The British acquisition of the fort ended the uprising; Bahadur Shah Zafar was detained, put to trial and later exiled to Rangoon.